As we learned at the International Clubroot Workshop, genetic resistance to clubroot is failing at an increasing rate all around the world. To help reduce selection pressure for clubroot pathotypes that can overcome the current resistance traits, the Canadian approach is to deploy clubroot-resistant (CR) canola seed varieties as soon as clubroot is seen in an area. This will help to keep spore counts as low as possible for as long as possible (but this needs to be combined with other management approaches including a minimum two-year break between canola crops). 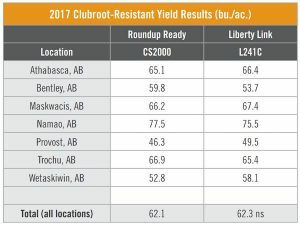 With clubroot found in more areas in Western Canada this year, it should mean high demand for CR varieties for 2019. Most seed companies offer strong-performing CR varieties, and farmers may want to book these varieties early. Find data on the past performance of clubroot varieties in small plot trials and field scale trials in the 2017 CPT booklet (pages 6 & 13) and the Canola Variety Selection Guide (page 18). The 2018 trials have even more clubroot resistance variety entries than in 2017 and the final dataset will be posted HERE once complete (after it is all submitted and carefully reviewed by the CPT Technical Committee). See the latest clubroot infection maps from Manitoba and Alberta on clubroot.ca. CPT trials in 2017 included field scale comparisons of two CR varieties.